How much wireless is being used in video surveillance? While wireless becomes more and more ubiquitous for smart phones and tablets, what is its uptake in the video surveillance market. In this note, we examine usage patterns across 100 integrators globally including detailed statistics of cameras using wireless connections. Wireless built in to the camera: This is the least commonly used form, generally only used in small projects such as home or SMB applications. Indeed, very few professional IP cameras even offer this as an option. Wireless connection for a single camera: The most commonly used form, a wireless appliance is co-located with a single camera. Generally, these units provider higher gain antennas and more advanced wireless / security features that wireless built into cameras. Wireless backhaul for many cameras: Sometimes, a facility may have a number of cameras but have no hard wired connection to the main monitoring facility (e.g., a water tower or storage area). In these scenarios, each camera will have a wired connection to a central point in the facility that then connects to a single wireless appliance to transmit back to the main location. In our survey to integrators, we asked the following questions about their wireless use: "In the past 3 months, what percentage of all cameras you deployed used a wireless connection to your server/recorder?" Since wireless use is clearly a niche, we phrased it to make as broad as possible, covering all 3 scenarios above. As the 'L' shape indicates, overwhelmingly, integrators use almost no wireless. About 20% of them use wireless between 5% and 25%, signaling that more advanced integrators use wireless as a niche option. The smaller bars on the right hand side indicate that a small number of integrators are wireless surveillance specialists. The median signifies that if you randomly approached an integrator (i.e., on a trade show floor), the most likely response would be that they use no wireless for surveillance. The mean wireless usage per integrator emphasizes that some integrators use significantly more than the average (median). This reflects the fact that specialist integrators exist who are using 40% to 70% wireless in their deployments. Overall, we estimate that 1 out of every 40 cameras being deployed currently use a wireless connection. It registers but at a very low level. 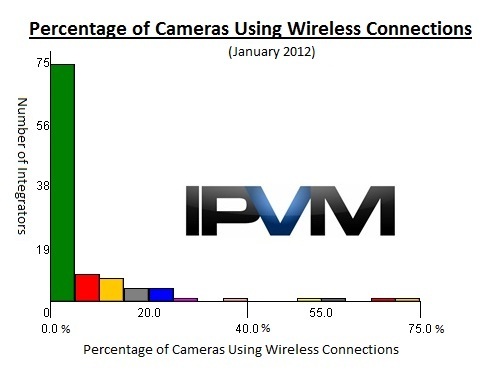 It is interesting to note that integrators who deploy large camera counts tend to use less wireless than the mean. This reflects that large facilities overwhelmingly use hard wire connections. While the numbers are quite low, we suspect that the percentage is up significantly over the last 5 - 10 years. Since this is our first formal survey, we are guessing but it is likely that the overall percentage was under 1% in the past decade. Going forward, we would expect wireless surveillance usage to increase modestly against wireline with greater use of low cost wireless equipment (like Ubiquiti) and as new technologies such as 'gigabit WiFi' and whitespace radio emerge. However, wireless connections will likely remain significantly under 10% of all surveillance cameras as the lower cost and higher reliability of hard wired connections continues to drive the market.